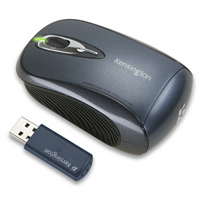 Kensington Si650m wireless notebook optical mouse for PC (desktop or notebook) or Mac is a new wireless mouse from Kensington for mobile and portability. Si650m wireless optical mouse features comfortable mid-size shape sculpted grips, Performance Optical Technology 1000dpi optical tracking, 4-way tilt-scroll wheel, 2.4Ghz wireless technology, mini receiver that stores inside the mouse plus automatically turns the mouse off when stowed, battery indicator signal, comes with batteries with life expectancy up to 9 months on 2 AA batteries. Last but not least, Kensington Si650m has 5 years warranty.